Many people who have seen an ad for IQ Option ask, what is my experience with IQ Options? Would I recommend trading with them to my readers or friends? And why? Answers to these questions and many others can be found in this article. Why should I trade with IQ Option? I’ll tell you one thing. The broker’s website is visited by millions of people every month. In April 2016 it was around 25 million (25 million) people. Secondly, this broker has 11 million active trading accounts that make over 1.5 million trades every day. I think that this statistic speaks for itself. When we look at e.g. our favorite broker stockpair – they “only” have 300,000 visitors to the site per month. So why would people trade with this broker (IQ Option) if they were bad? Because they are not, read more! Their platform for executing trades is as fast as a lightning, trades are evaluated within seconds, so no need to worry whether the broker has manipulated the price, as it can sometimes happen with fraud and scam brokers. IQ Option offers countless types of assets, perhaps the most I’ve ever seen, over 120. The only problem is that if you are not a VIP member (you need to deposit a minimum of $ 3,000) you don’t have a good return on options. Short-term option are available for non-VIP members with the return between 85-90%. Otherwise, in the normal options (5-30 minutes), the return is around 73%. VIP’s returns are up to 92%. But this is certainly not among the worst on the market. Demo account can be activated immediately after setting up the account and once you’ve made your first deposit, the demo account automatically switches into real mode. You can switch back and forth between this demo (training) account and a real account quickly by pressing the downward arrow next to your current account balance. 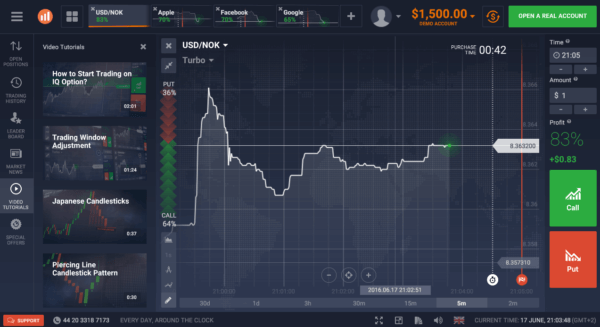 What is YOUR experience with IQOption ? News: Digital contract options. Is IQ Option at the top now? Three types of accounts offered by IQ Option.